Hi guys, I have started getting popup adverts. I have had them for about 3 days now. I haven't knowingly downloaded or clicked anything suspicious. I am quite careful. They appear only when connected to the Internet, WiFi or mobile data. A chrome window appears in the top bar. They are usually betting adverts. Welcome to Android Central! Does it only happen when you're actively using the browser, or do they also show up when you're using other apps? Welcome to the forums. See if this helps. It's an ad that's being served up by a website on Chrome, which at some point you gave permission for. 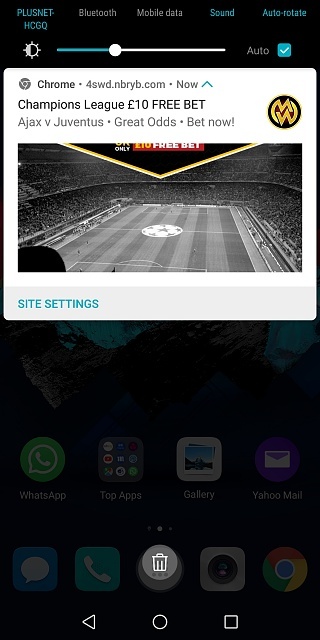 In that screenshot, do you see the Site Settings option in the notification? Tap that, which will bring you to that part of the Chrome settings, then tap Notifications. You should be able to find that site listed there, and you should be able to block notifications from it. Thanks for your help guys. So far so good. I have blocked it via the site settings link. Any idea why android system keeps going up? Why does my stock gallery app not pick up all my album folders? How do I set up voice activate unlock + dial emergency number?